KATHMANDU, Oct 7: Lawmakers from major political parties have proposed introducing threshold provision for a political party to qualify as national political party. The lawmakers have registered amendment proposals on the bill to amend the laws related to political parties in parliament. Lawmakers of the parliament's largest political party, Nepali Congress (NC), have proposed including a provision in the bill to make it mandatory for any political party to secure at least five percent of the total valid votes cast across the country to become a national political party. Likewise, lawmakers of the second largest CPN-UML have proposed three percent threshold provision for the same purpose. Member of Parliaments from the third-largest CPN (Maoist Center) have however registered amendment to the bill suggesting that only the political parties that secure 1.5 percent or more votes should be entitled to state priveleges. The Ministry of Home Affairs tabled three bills in parliament earlier this week for deliberations and amendments, if any. Altogether 20 amendment proposals have been registered at parliament secretariat seeking changes in the three bills -- bill related to the political parties, bill to amend and integrate duties, responsibilities and jurisdiction of the Election Commission, and bill to amend and integrate laws related to the voter list. Ramhari Khatiwada and Bharat Shah of the NC proposed changes to the provisions related to political parties. Khatiwada has demanded that a political party must secure five percent or more votes to become a national political party. “A political party must secure at least five percent votes to enjoy the status of national political party in parliament,” reads the amendment proposal registered by Khatiwada. 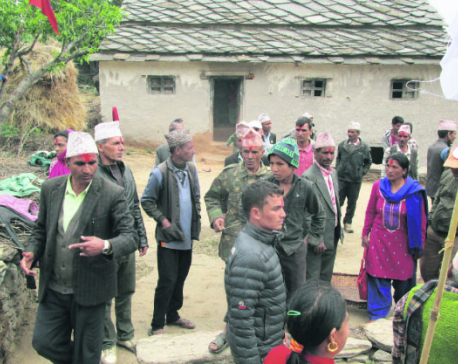 Similarly another amendment proposal registered by UML lawmaker Rajendra Pandey has demanded that political parties securing only at least three percent votes in the parliamentary election or having at least one MP in the House of Representatives should be accorded the status of national political party. Pandey has also proposed providing state funding to the political parties on the basis of their parliamentary strength on the recommendations of the Election Commission. Ram Narayan Bidari of the CPN (Maoist Center) hasn't directly proposed introducing threshold provision. He however has proposed that the government should provide state facilities only to those political parties that secure at least 1.5 percent of the popular votes in a parliamentary election. Bidari has proposed providing state funds to the political parties based on their strength in the parliamentary election. Similarly, women lawmakers from the Maoist Center including Aasha Koirala and Rupa Maharjan among others, have registered amendment proposals demanding 33 percent reservations for women in office bearer positions and central bodies of the political parties. On the other hand, fringe parties have registered amendment proposals demanding complete removal of threshold. Lawmakers Hari Charan Sah, Rukmani Chaudhari, Yashoda Lama and Prem Bahadur Singh have demanded removal of the term national political party in bill. All of these lawmakers are from political parties that have just one seat each in parliament. If a threshold provision is introduced, any political party failing to meet the threshold will be relegated to the status of a regional political party. Meanwhile, UML lawmakers Bhim Rawal and Agni Kharel have demanded that the authority for setting elections dates should remain with the Election Commission and not to the government. The bill to amend and integrate duties, responsibilities and jurisdiction of the Election Commission has proposed that the government should fix the election date as per the recommendation by the commission.